big zuke, originally uploaded by jahansell. And that's not even the biggest one! Zucchini (courgette, or Cucurbita pepo) should be eaten when it's no more than, oh, 6-8" long, I'd say. But if you miss one on the plant, and let it grow for a day or two too long, it turns out like this! Why am I including this photo on SharonCT Daily photo? Well, it is farm country! I love zucchini bread but haven't made it in along time. 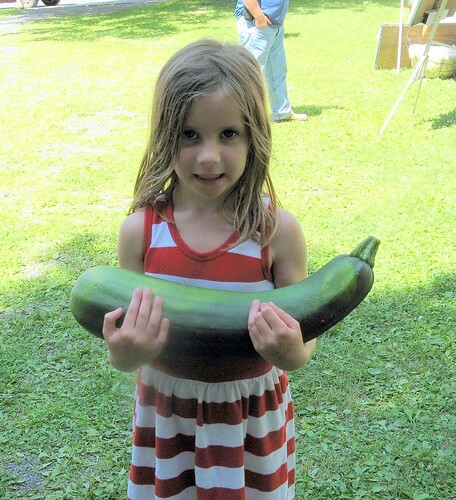 We like to cook zucchini with yellow squash, and we have some squash almost that big! Wow, It's so big, but I don't like it. We call it "Pepino" here. That's a monster! I'm with lv2scpbk.. used to make zucchini bread and loved it but haven't made it in years. That is an amazing plant and the little girl holding it is so cute. I just had some zucchini bread the other day that my daughter made and it is delicious.